• Shower or bathe in water that is near skin temperature. • Seniors should seek help if they experience lightheadedness, heat cramps, heavy sweating, thirst, faintness, confusion or nausea. 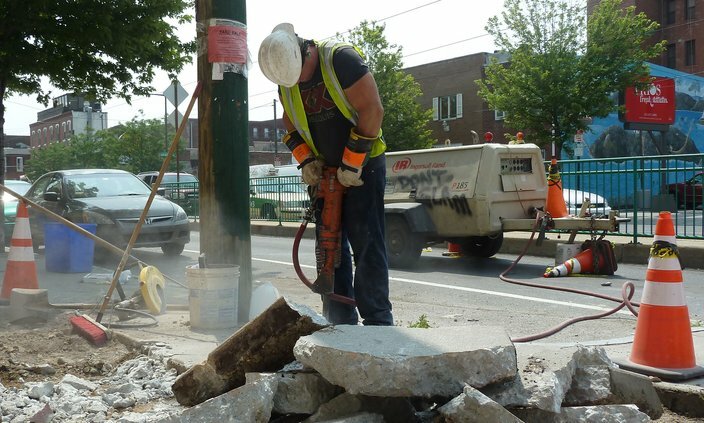 Mike Breslin of Northeast Philadelphia jackhammers a sidewalk at Fourth Street and Girard Avenue in Olde Kensington during a 2015 heat wave. The Occupational Safety and Health Administration (OSHA) reminds employers to protect workers from heat illness. If a job requires working long hours outdoors, employers should take necessary precautions to keep workers safe – providing frequent water breaks, shaded areas and enough time to rest. The nonprofit Philadelphia Corporation for Aging's Heatline is an extended version of its Helpline that provides additional help for seniors feeling the heat. When activated, the Philadelphia Department of Health provides nurses who answer questions about the heat and how to detect signs of heat stress. Mobile teams are ready to respond to situations needing intervention. The Heatline operates from 8:30 a.m. to midnight and on weekends. The Free Library locations listed below will be open for people to escape the heat. Residents can visit these locations to rest in an air‐conditioned space with access to books, computers and wireless internet. Branches may extend their hours, and residents should be sure to call the cooling centers beforehand to make sure they are open. Here's a list of other public sites with air conditioning. During severe heat waves, the Camden County Freeholder Board often distributes free fans to residents age 60 and older with an income of $25,000 or less. To request a fan or get information, call the Camden County Division of Senior Services at (856) 858-3220. • Keep dogs indoors: Unlike humans, dogs can only sweat through their footpads and cool themselves by panting. Soaring temperatures can cause heat stress, injury, or death. • Provide water and shade: When outside, animals must have access to fresh water and ample shade, and the shifting sun needs to be taken into account. Even brief periods of direct exposure to the sun can have life-threatening consequences. • Walk — don't run: In very hot, humid weather, never exercise dogs by biking and making them run alongside you or by running them while you jog. Dogs will collapse before giving up, at which point, it may be too late to save them. • Avoid hot cars: Never leave an animal in a parked car in warm weather, even for short periods with the windows partially rolled down. Dogs trapped inside hot cars can succumb to heatstroke within minutes – even if a car isn't parked in direct sunlight. • Stay alert and save a life: Keep an eye on all outdoor animals. Make sure that they have adequate water and shelter. If you see an animal in distress, provide him or her with water for immediate relief and contact humane authorities right away. • Avoid hot pavement: When outdoor temperatures reach the 80s, asphalt temperatures can reach 140 degrees, causing pain, burns, permanent damage, and scarring on dogs' paws after just a few minutes of contact. Walk on grass when possible, and avoid walking in the middle of the day. • Use a cooling vest or mat: Dog cooling equipment, such as wearable vests or bed mats, come in a range of materials and prices and help prevent overheating. Simply freeze or soak the items in cold water to keep dogs comfortable while on a walk or lounging. Placing cold water bottles in a dog's bed also works.